Self-appointed Internet cops are forcing accountability for the dirtiest tricks in politics. With a “dog whistle,” politicians use code words to signal unpopular stances to one target audience, while avoiding a backlash because the reference is lost on others. Many people miss President Bush’s layered language for evangelicals, from hinting that legal abortion is like slavery to his odd prediction that history will see Iraq as just “a comma.” (It only makes sense if you know the proverb, “Never put a period where God has put a comma.”) Code words don’t fool everyone, but from “states’ rights” to “welfare queens,” GOP campaigns have tapped racial resentment without facing widespread opprobrium. Secret smears run on a similar axis, enabling politicians to undermine an opponent without taking responsibility for the attack. But the times are changing. From his race to his name, Barack Obama seemed like the perfect target for such coded attacks. Indeed, some Republicans were eager to run the old playbook on him. “Count me down as somebody who underestimates Barack Hussein Obama, please,” said GOP strategist Ed Rogers, speaking on MSNBC’s Hardball in the headier days of 2006. Yet Rogers, like the McCain campaign, underestimated not only Obama but a new media model that swiftly blasts would-be Swiftboaters. Once exposed, McCain’s robocalls were unpalatable even to his allies in the party and the media, adding another “Hey, Rube” squabble to his already contentious campaign. Republican senators condemned the calls. Fox News’s Chris Wallace pressed McCain on the issue, reminding the senator that he once denounced such tactics. Even Sarah Palin felt compelled to respond to criticism of the campaign’s robocalls, telling reporters that while she did not renounce them, she would prefer to do personal and retail campaigning instead. All this online activity has been amplified by the rapidly shifting landscape of political television. The increasingly opinionated cable news programs, always in search of conflict and fresh content, now treat debates over these tactics as a major campaign issue. This emphasis is bleeding into the broader campaign discourse, which includes minute dissection of attacks that were once considered unmentionable. 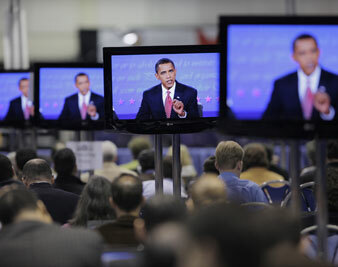 A whole range of smears against Obama, for example, have been exposed under the glare of nationally televised debates. Sometimes that process has angered his supporters–as when the ABC News primary debate focused on smears regarding “patriotism” and Islam. In one of the general election debates, CBS moderator Bob Scheiffer was credited for playing a corrective role when he pressed both candidates to answer for attacks from their supporters. That is a stark contrast to the previous two presidential races, when even the most incendiary attacks drew scant calls for accountability at the candidate level. The infamous Swiftboat attacks against John Kerry, for example, were barely a blip in the 2004 presidential debates. Sure, everyone knew about them, but no voters ever saw President Bush defend them. Run the tape back to 2000, and Bush was never forced to fully answer for one of his most vile political attacks, the racist smear against John McCain’s family in the South Carolina primary. Today, it is hard to imagine a candidate in either party sliding through a presidential primary without a huge backlash for deploying that kind of attack. It is not hard to decipher the strategy. McCain has concluded his only road to Washington runs through Tehran–if he can convince voters that’s where Obama belongs. On Wednesday, The Huffington Post, which now draws more traffic than The Drudge Report, was all over the case. Under the banner “McCain’s Last Ditch Effort: Tying Obama to Muslim World,” Sam Stein reported, “McCain’s campaign is making what appears to be a final, full-throated effort to paint Barack Obama as a sympathizer with the Muslim world.” There is no equivocating debate or time-lapse delay. An influential driver of political news is exposing McCain for doing exactly what he pledged to avoid–stoking bigoted, racial and religious division to turn people away from his opponent. With sustained attention on these attacks, it appears that voters are increasingly recoiling from McCain’s offensive. Google CEO Eric Schmidt, who endorsed Obama and recently appeared in his prime-time infomercial, told Huffington that we are witnessing the “end of Rovian politics.” That is probably one step too far. This new media environment undermines political attacks that turn on coded meanings and hidden messages, because now anything can be exposed and cheaply disseminated. Observers used to worry that the web would fragment our media consumption into private little silos–that famous “Daily Me.” Yet in presidential politics, an inverse dynamic is emerging. Small groups of people are using the web to expose the targeted appeals of the analog world, and then injecting them into the mass media for the whole nation to assess. And many voters do not like what they see. Like any other transparency measure, however, this process only enhances the potential for accountability. It does not automatically halt any conduct. It does not ensure, as Schmidt may imagine, that “Rovian” attacks are now futile–or that voters will always recoil from them. Instead, it simply means that candidates will increasingly have to answer for their code words and targeted appeals. Operatives will worry more about how a “secret” smear will play when it is exposed, since it probably will be. Attacks that turn off large swaths of the electorate, like smearing a candidate’s family, will keep fading. “Rovian” ploys that hammer more vulnerable targets, however, will not be cut down by exposure alone. (Consider how the GOP has excelled by open gay-bashing, including Rove’s own gay marriage strategy in 2004, with no code words needed.) So more transparency is a welcome development, but as Obama can tell you, real “change” only comes from the bottom up.